Now THIS is a beautiful car! It’s a used Aston Martin DB9 Volante, a 2008 model, on the showroom floor at the Select Luxury Cars dealership in Marietta, GA, just NW of Atlanta. 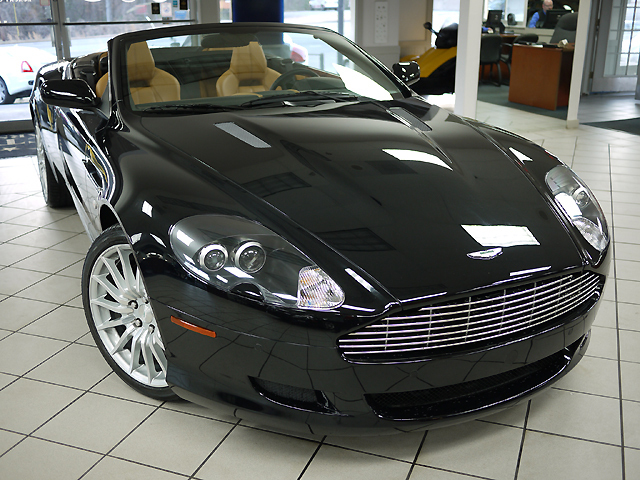 This DB9 Convertible is black with a tan interior. Under the hood it boasts a 6.0L DOHC 48-valve V12 engine with less than 6,000 miles. Here’s a video walkthrough so you can see the condition and features of this work of art. This pre-owned Aston Martin DB9 Volante is CarFax certified, with only one previous owner, low miles, an automatic transmission, a navigation system, parking sensors, satellite radio, heated seats, Xenon headlamps, power seats, a full windscreen, and is in “like new” condition. You can view it in person at the Select Luxury Cars dealership at 985 Cobb Parkway South, Marietta, GA 30060. Call 678.622.5587 and our sales team will help you with any questions or if you’re ready to buy an Aston Martin DB9 Volante. We can arrange for delivery worldwide – except, of course, countries with which the U.S. has a trade embargo. Select Luxury Cars is a dealership specializing in preowned luxury vehicles, used sports cars, exotics, and sports utility vehicles. Great customer review on Yahoo! for Select Luxury Cars 64 miles per gallon in the near future?